People in Mexico enjoy a kaleidoscope of vibrant colors from beautiful blooming plants that grow there year-round. Local people seem unable to exist without flowers in their everyday lives. Home gardens, markets, shrines and altars blaze with colorful bouquets and smothered in blossoms during holidays. There are usually bouquets and flower pots in every Mexican home, any time of the year. Flowers are among the best gifts to send to Mexico (coming close only to tequila). Here is our guide to Mexico’s most popular flowers and when you should send them. Mexico’s love for flowers goes back to its remote ancestors. Flowers have played a significant role in the myths of Mexican people since pre-Columbian times. To the Mayans, flowers were holy objects that played a big part in all religious rituals. The Mayans often brought flowers to their altars to please the ancient gods. Many stories say these gods came from flowers and they are often depicted covered in blossoms in paintings and statues. There have always been plenty of beautiful vibrant flowers in Mexico to go around. Many of the world’s most exotic blooms are indigenous to this country. Striking Bird of Paradise, delicate Frangipani, spectacular Dahila, cheerful marigolds, showy Poinsettia, extravagant varieties of Orchids are some of the unique blooms growing here. 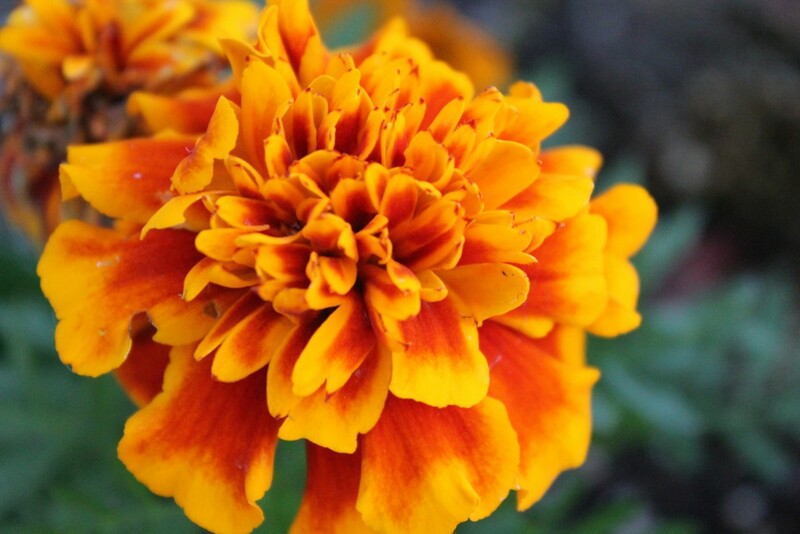 Vibrant orange-colored marigold flower (or Cempaxochitl) is the most popular in Mexico during fall. A member of the sunflower family, it blossoms only after the rainy season. This beautiful bloom has come to be strongly associated with the Day of the Dead in Mexico. Observed at the start of November, it is one of the most important cultural and religious events in the country. The festival celebrates life and honors the lives of the family members who have passed. The most recognizable symbol of Day of the Dead, marigolds play a significant part in the celebration. It’s impossible to walk the streets of Mexico in late October without seeing these bright and enlivening flowers everywhere around you. Locals use them to decorate home altars, doorways, and graves, to make garlands, and even in ladies’ hair. Locally known as the “flower of the dead,” marigolds are believed to guide the spirits of the dead who visit the living during the celebration. Aside from being the iconic Day of the Dead flower, marigold is commonly known as a symbol of joy. If you or your dear friend is feeling down and needs a quick pick me up, there’s nothing like a bouquet to Mexico of vibrant marigolds. They are also go-to flowers on a number of occasions including birthdays, memorials for lost loved ones and religious ceremonies. Did you know that marigold flowers (or just their petals) are actually edible? The flavors of different varieties range from spicy to bitter, zesty to peppery. Their flower petals can provide flavor and decoration to soups, salads, rice, pasta, as well as in herbal teas. Orange hues in the petals add a golden tint to lots of recipes and are an excellent replacement for saffron. The petals can also produce yellow food coloring and dyes, and its flowers and stems are a base for herbal medicine. Summertime in Mexico brings the vibrant dahlias out in their full majestic bloom. A garden plant with one of the longest and prettiest bloom seasons. It’s easy to see why it has become the national flower of such a color-loving country as Mexico. After more than 200 years of selective breeding and hybridization, today’s dahlia comes in a large variety of hues, shapes and sizes. Its striking beauty and versatility make it a favorite flower among landscapers and florists alike. Dahlia’s range of colors is vast and truly breathtaking. They come in deep burgundy reds, creamy pinks, all shades of purples, as well as delicate blush and whites. Dahlias come in all sorts of patterns, too; some even have stripes or multi-colored edges. The petals vary from long to short, pointed or round, ruffled or structured. Because of the extensive variety of colors and shapes available they are used in both bright festive flower arrangements, and more delicate romantic bouquets to Mexico. Even though dahlias have been Mexico’s official national flower since the early 60s, their story is actually rooted in ancient Aztec culture. There is little information about the flower before that time. However, to the Aztecs, dahlias were more than just pretty blooms: they were an important resource for. The Aztec people ate dahlias, much like we eat celery and potatoes today. They used them for treating diseases as well. Even more importantly, the long hollow stems can grow over 20 feet long. The Aztecs used them to carry and store water. 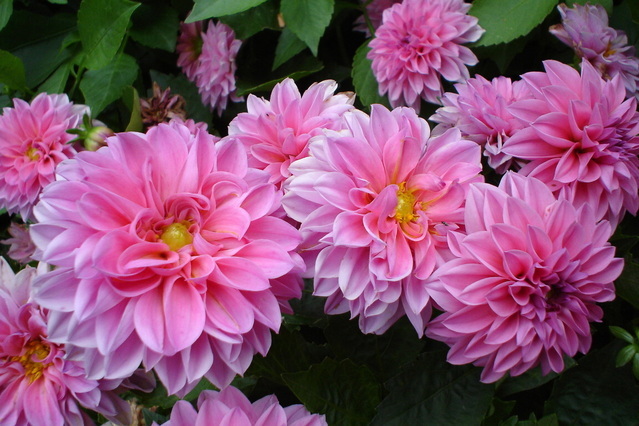 Native to Mexico, dahlias made their way to Spain with conquistadors in the 16th century. They soon spread across Europe where they got their name from a Swedish botanist: Dr. Anders Dahl. Then they traveled from Mexico to the United States, quickly becoming one of the most popular garden flowers in the world. In Mexican culture the dahlia is hugely important. It symbolizes change, travel and new adventures. In the Victorian language of flowers, the dahlia expresses sentiments of virtue and grace. When given as a gift it is a symbol of a commitment and bond that never ends. Because of its symbolism, the dahlia flower is very popular in flower arrangements for celebrating love and marriage. Its romantic symbolism and delicate beauty make it a popular choice for anniversary gifts as well as in bridal and wedding bouquets in Mexico and around the world. It’s true that the most popular months to tie the knot (from late spring through early fall) do perfectly coincide with the peak of dahlia season. But that’s not the main reason why brides so love these truly captivating cut flowers in wedding bouquets. Dahlias grow abundantly for several months, they are much more affordable and easy to find than other wedding favorites (like peonies or gardenias), and they come in all types of shapes, colors and sizes. While dahlias are surely practical, there’s no denying that they are very exuberant and striking. Besides, with dozens of common varieties grown, there’s no shortage of options to pick from in order to find a perfect match for any wedding aesthetic. The main symbol of Christmas and the most famous winter flower around the world, poinsettia is native to the hot and dry climate of Mexico. 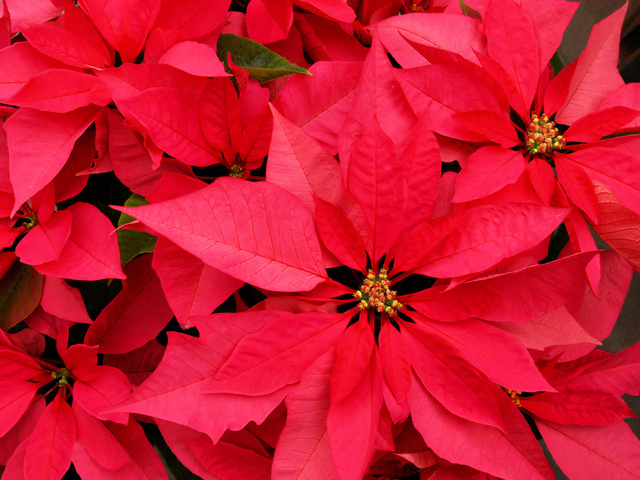 The plant’s vibrant and cheerful red color and its star-shaped leaves perfectly represent the winter holiday season. In Mexico, it’s called Nochebuena which means “good night” and refers to Christmas Eve. And for Mexicans the Poinsettia is indeed the main Christmas Eve flower. The history of the Poinsettia goes back to the Aztecs, for whom it was very important. To those powerful ancient people, it symbolized a new life warriors gained in battles. The plant’s bright red color symbolized blood and was significant in Aztec religious rituals. The Poinsettia became known as a Christmas flower during the colonial period. Its shape reminded people of a Star of David and its leaves turned bright red right around Christmas-time. That’s when Mexicans started decorating churches and houses for the Christmas season with the Poinsettia and it eventually became the main emblem of the holiday. The “Mexican Fire Plant” appeared in the United States in the 19th century when the first U.S. Ambassador to Mexico, Joel Poinsett, brought the plant to his home in South Carolina. Cultivators named the flower him and soon it became a popular Christmas symbol all over the world. A beacon of love and joy, the Poinsettia plant is one of the best suited and most desirable Christmas gifts to Mexico. It will fill any home with holiday cheer, good vibes and promise a blessed year ahead. Want to learn more about this wonderful Christmas plant? Check out Poinsettia History: One of the Best Christmas Flowers. We talked a lot about some of Mexico’s most popular flowers. But are there any taboos worth knowing when choosing bouquets to Mexico? There are just a few rules you should be aware of. – To some people, red flowers are bad luck (some even say they’re useful for magic spells). But when it comes to romantic and Valentine’s gifts to Mexico, the rule does not apply and red is always the first choice to express love and passion. – Yellow flowers usually symbolize death. Avoid yellow flower arrangements unless you’re sending a condolence gift to Mexico. – Purple is also a color for mourning. It’s better to use purple flowers in bouquets in moderation to avoid any misunderstanding. A country rich in traditions and history, Mexico boasts numerous holidays throughout the year that call for gift exchange and sending flowers. Whether part of historical events or religious tradition, Mexican people enjoy themselves every fiesta and flowers play a key role in each celebration. Ready to send a bouquet of pretty flowers to Mexico? – We are too! Pick your favorite arrangement in our flower catalog and have it delivered in no time. – Make sure to sign up for our newsletter to get holiday reminders and notifications about new blogs. – Share this blog on social media to help your friends and family stay informed.